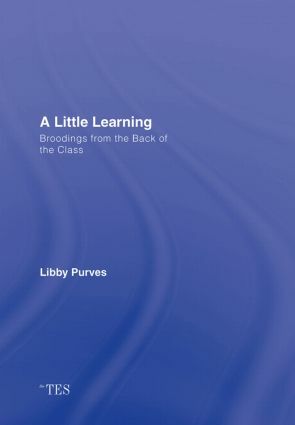 This lively selection brings together journalist and broadcaster Libby Purves’ experiences as journalist, parent, governor and former pupil of half a dozen assorted schools from Bangkok to Tunbridge Wells, displaying her eclectic and provocative opinions and ideas on teaching and learning. This collection of the best of her writing in the Times Educational Supplement covers - sometimes thoughtfully, sometimes mockingly - everything from national policy to the eccentricities of headteachers and the limitations of IT. Education professionals over the years have received her outsider view with enthusiasm, laughter, inspiration and occasional fury. From ministerial madness to the pitfalls of uniform and the vagaries of teenagers, this book is dedicated to the amusement of a cadre of professionals Libby once planned to join, until she lost her nerve. It is dedicated, with thanks and admiration, to all teachers. A household name in the UK, Libby Purves is the erudite presenter of a number of radio programmes on BBC Radio 4 including "Mid Week" and "The Learning Curve". She writes regularly on educational and cultural issues in many of the quality newspapers in the UK and has a regular column in the Times Educational Supplement. As a writer of fiction she is well known both in the UK and overseas.